Sonar Q Quick Release, the latest innovation of the Sonar brand, accelerates the release of Sonar concentrations into the water column. Formulated as a 5% active ingredient on a 1/8-inch diameter granular pellet, Sonar Q quickly expands for an accelerated release providing better control in ponds with muck sediments and high organic content. 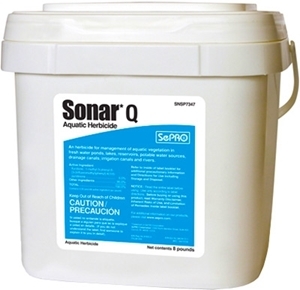 Sonar Q Quick Release Aquatic Herbicide is the fastest releasing Sonar pellet in a quick, easy-to-apply formulation. Sonar Q Quick Release, the latest innovation of the Sonar brand, accelerates the release of Sonar concentrations into the water column. Formulated as a 5% active ingredient on a 1/8-inch diameter granular pellet, Sonar Q quickly expands for an accelerated release providing better control in ponds with muck sediments and high organic content. When used in ponds, Sonar Q releases a higher amount of active ingredient into the plant than other Sonar pellet formulations in a shorter amount of time. The Sonar Q pellet begins the degradation process immediately upon contact with the water. Once submerged the Sonar Quick Release pellet swells and expands, transforming the pellet into a buoyant composition that will rest on top of soft muck bottom sediments. Sonar Q has the efficient concentration level of a liquid, but provides for more accurate placement. The pellets will land where they are thrown, eliminating overspray onto sensitive shoreline vegetation like lawns. Sonar Q Aquatic Herbicide selectivity is dependent upon dosage, time of year, stage of growth, method of application and water movement. Please see the Sonar label for an outline of vascular aquatic plants controlled, partially controlled and not controlled by Sonar. Algae (chara, nitella, filamentous species) are not controlled by Sonar. Consult a SePRO Aquatic Specialist prior to application of Sonar Aquatic Herbicide to determine your target plants' susceptibility.